« Gingerbread Man Activity- No Baking Required! As a child I always loved playing with a little clothesline that I would tie between trees while hanging my little doll clothes on it. 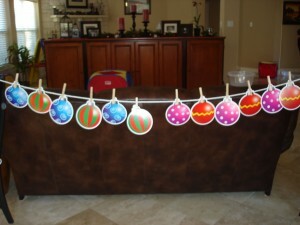 When I taught kindergarten, I used a clothesline as a station center but instead of hanging clothes on it, the children used it to work on building fine motor skills of pinching open clothespins, placing pieces to be clipped in the right place and making patterns or matching items together. They loved it and would have the cutest, serious expressions on their faces while they were working and concentrating so hard on completing this task. I decided to use it in My Obstacle Course with Andrew and got to see firsthand how challenging this is for little fingers and all that goes into taking an item and clipping it onto the line. Adults make it look so easy! So many things have to be done at the same time, in the right place so that the item actually stays where it belongs. For someone with motor planning and fine motor issues, this was going to be a perfect opportunity to practice. clothesline (we got ours at Lowe’s)- you can cut it down to the length you have room for in your space or do what I do which is to just tie one end to the chair and then clip the other end like it is tied, allowing the remainder of the clothesline to sit on seat of the chair. I had been wanting to work on patterns with my son and found a package with large ornament pieces, with 6 of a kind (you could also make your own with construction paper or wrapping paper, they would just be a little more flimsy). These could be used on the floor to make patterns but they were also sturdy enough to be used in the same way but on the clothesline. Combining two skills, one that he struggled with (fine motor planning) and one that he enjoyed doing (patterns) has been key in getting his to work on more challenging things. Note: Keep this in mind when you are trying to build skills your child is struggling with. Is there a way to mix it in with something they do enjoy? It doesn’t take much to make an activity that your child may remember into their adult years like I did. Once you have the materials, it takes about 2 minutes to set up – piece of cake! !